Silver Maple - Acer saccharinum. 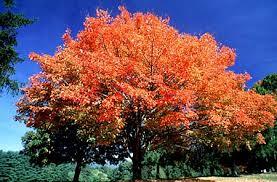 Silver maple trees are deciduous trees which grow relatively fast. Generally, they reach a height of between 49 and 82 feet upon maturity. The leaf spread will typically grow to between 36 and 49 feet wide. This maple tree is a native of North America that usually develops in wetlands, along rivers, and in other areas with damp soil. The leaves are simple, meaning they do not grow in clusters. They have palmate veins and five lobes. Between each of the nodes are deep angled notches. Underneath the leaves is a soft silver texture. In the autumn, this tree turns pale yellow. Silver Maple Live Stakes are used to Establish a mature tree. Silver Maple Live Stakes is also known as Acer saccharinum. The leaves of this tree have five lobes each and are covered with teeth. They are green on top and a whitish color underneath. For the spring the silver maple has reddish-brown fruit that attracts many kinds of birds. This deciduous tree puts on a yellow during fall. The silver maple is not tolerant to clay soils though it likes full sun. This tree is a great windbreaker and cover for birds. The silver maple is also a deer and squirrel attractant. Silver maple is considered a softwood which means holes can form in it and these give shelter to small mammals like squirrels and rabbits. A lot of wildlife animals thrive on these types of trees because they can call it home and feel safe in it. Silver Maple Live Stakes is classified as a deciduous tree and has a rough feeling trunk. The leaves are dark green and can grow up to 3 inches long. The flowers are green and yellow which will bloom in the spring months. They can adapt quickly to many different soil types but prefer moist, well-drained soil. This tree is great to use as an ornamental tree or planted alone for an accent piece.